^ EXOTE, EXHIBITION#1 by Kris Verdonck, 01.05-21.08.2011 at Z33. Photos by Kristof Vrancken via wemakemoneynotart and featured at Volume#31 – Guilty Landscapes. EXOTE [Exhibition#1, by Kris Verdonck] is a metaphorical garden installation with a selection of invasive alien species (fauna and flora) in Belgium that form a potential danger for biodiversity, economy and human health. It is some sort of ‘end-of-the-world’ landscape and a metaphor for a world in which man has to protect himself against an environment that he created himself. The indoor garden is part of a route with some of Kris Verdonck’s earlier projections and installations, gathered in a new context. 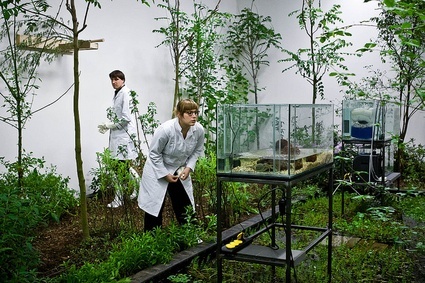 In the performance END artist Kris Verdonck shows the possible final stages of a human society in ten scenes. Melting glaciers, burning forests, cities under water, ubiquitous screens and cameras spying on us, the uncontrolled availability of weapons of mass destruction, and so on. END starts out from the images the media project onto our retinas all day and every day. The ten scenes are linked by a monologue spoken by a single character: the witness who sees it all happen. While this survivor – like the messenger in Greek tragedy – talks unceasingly, a series of ‘Figures’ appears on stage: machines and people or a combination of the two. They go from one side of the stage to the other, all in the same direction. Are they fleeing something? If so, what?